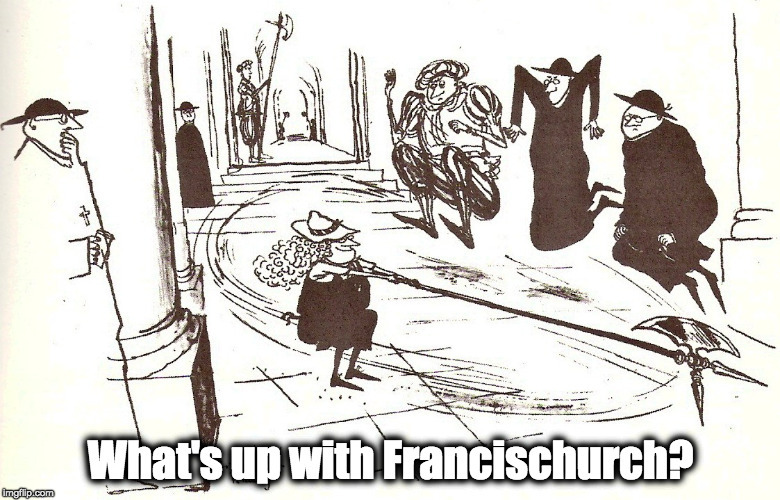 The squid-ink pontificate: weaponised irrationality – What's Up With Francis-Church? I think people are starting to get it: the most important thing to understand about this pope is that what he says, the actual content of his various discourses, is way less important than what he does. His words are ALWAYS intended as misdirection, whether their content is orthodox Catholicism or otherwise. He’s the squid-ink papacy; he shoots out a cloud of irrationality to cover his retreat whenever he feels like he’s in trouble. In the first part of his remarks, he defended with sword drawn the “gift” of celibacy and its perennial validity, which he says he does not intend to put into discussion, not even in the distant future. But then look at how he makes an exception: “There would only remain some possibility of it in far-off places, I am thinking of islands in the Pacific Ocean, it is something to consider when there is a pastoral necessity.” Which is to say: If there is a shortage of priests and the Eucharist can only be rarely distributed, then it’s okay. And thus we understand why certain news agencies ran headlines about this press conference saying, “Pope Says Celibacy Cannot Be Changed” while others said “Pope Says He Is Open To Married Priests.” From his discourse, each one can take the part which is most convenient for him. In reality, going more to the roots of his response, it’s clear that we are always in the midst of the method of “initiating processes,” which is so dear to him. It always begins with exceptions: the far-off places, priests who visit their communities only once a year (but this is not a new problem, yet previous popes never considered the possibility of married priests), then the exceptions rapidly become the rule. It’s worth noting, however, that Bergoglio wasn’t the inventor of this bait and switch methodology. The documents of Vatican II are based on it, as were most of the papal decrees issued since John XXIII. Take only Communion in the Hand as an example. The Hamlet-pope Paul VI was incapable of saying a firm No, using a display of “pastoral” indecision as a stage magician uses misdirection, he issued a document lauding and praising to highest heaven the traditional way of receiving Holy Communion and saying it absolutely must remain the norm of the Church, but apparently in one leeeeetle tiny aside, allowing the little postern door of “pastoral necessity” to stand conveniently open, through which the hordes of Mordor poured. And it has been so for every issue of this kind that has come up ever since, from things that pertain only indirectly to sacramental doctrine like Latin in the liturgy and Altar Girls, right up to the barely disguised permission given in Amoris Laetitia for universal sacrilege. I’m also glad to see that Steve is starting to pick up stuff from my friend Riccardo Cascioli. He is one of the more sane and reasonable voices out there, who doesn’t get heard nearly enough through the language barrier. I introduced him and his paper, La Nuova Bussola Quotidiana (The Daily Compass) to LifeSite some years ago. And, he’s a really good guy and has been struggling a long time to get Italian Catholics to wake up. These beleaguered and long-suffering Italian traddies have been isolated in the Italian-language sphere for way too long, and they REAlly know what’s what in Rome. It’s refreshing to talk to people completely untouched by insane conservative papolatry. There never was in this country that annoying misdirection, the dead end of “Catholic conservatism” that has caused so much difficulty in the US and the Anglosphere. With their greater sense of the deep history of their country, Italians will never be bamboozled into worshiping the pope.